Now in a sturdy bilingual English-Spanish board book edition! A day at the park. A ride on Daddy’s back. Run, Daddy! Faster! Faster! How fast can Daddy go? Faster than a dog? A horse? How about a cheetah? Leslie Patricelli reprises the duo from Boston Globe–Horn Book Honor winner Higher! Higher! in another humorous riff on a favorite pastime — a laugh-out-loud-funny tale of few words about doting dads and high-energy kids whose imaginations know no bounds. 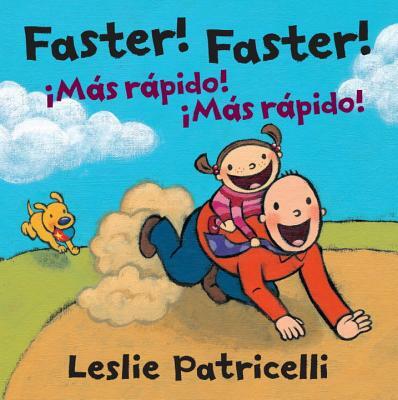 Leslie Patricelli is the creator of a series of best-selling board books starring her beloved baby character. She is also the author-illustrator of Fa La La, Higher! Higher! and Be Quiet, Mike! as well as two stories about the Patterson Puppies. She lives in Ketchum, Idaho.